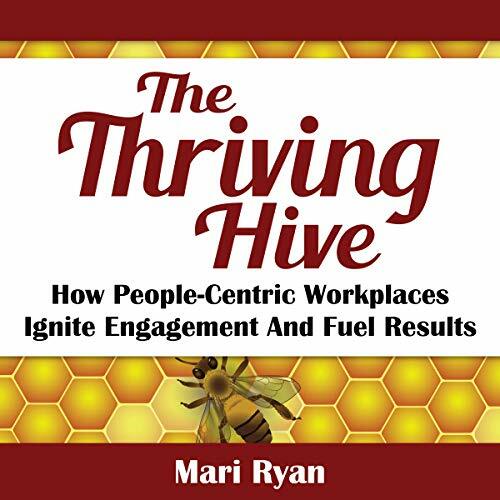 Mari Ryan, a workplace well-being strategist, tells a simple yet insightful story in The Thriving Hive: How People-Centric Workplaces Ignite Engagement and Fuel Results. A first-time CEO realizes her organization is no longer attracting and retaining the kinds of employees they need to remain competitive and keep their customers happy. She seeks help from a mentor, the retired former CEO. With his unconventional insights, he introduces her to two very different beehive workplace cultures and how they deal with adversity. Replete with interesting characters, the parable takes you on a journey as the bees experience hive-threatening situations. The story looks at the organizational behavior and how leadership and their management teams can create workplace cultures that diminish or support the well-being of their employees. You'll meet the management teams and worker bees that represent typical employees in any business. This is a quick listen for anyone who wants guidance for creating a culture of well-being, purpose, vitality, and satisfaction for an all-encompassing employee experience. I have had many leadership courses highlighting the way to lead a productive team. This books provides a nice story that is easy to make the distinction between leadership types and their impact to productivity and more importantly, workplace morale. I loved this book! Mari addresses two aspects of our world that are both in desperate need of new, innovative ways to keep them thriving, and that's workplace culture and honey bees. I am a trauma specialist, and Mari is spot-on on how to create a thriving workforce that actually reduces stress and anxiety rather than contributing to it. The corporate model that places mass production and profits above employee well-being is an antiquated approach that is, hopefully, on its way to extinction. Forward-thinking, compassionate companies are already headed in that direction, and the available workforce is taking notice! People are turning their backs on the toxic work environments because the stress is slowly killing us. It's a contributing factor in the epidemic levels of stress, anxiety, depression, mental health disorders, and chronic diseases we see all around us. Our lifestyles have to adapt, and our work is a big part of our lifestyle. Plus, we ALL need a bit of education on saving the honey bees. That's no joke! If the bees go extinct, so will we. Humans and other large mammals simply cannot survive without all the hard work the real honey bees do in the world. The Thriving Hive is a fantastic way to bring awareness to issues that are hidden in plain sight and begging for our help.